Happy Friday ladies! I hope you've got some fun plans for the weekend. I have to work again on Saturday but after that I plan on spending quality time with the family. I'm really loving corals this season, and that's a first for me as a self proclaimed hater of corals. I don't know what it is, but the corals I've seen have been stunning and perfect for the season. 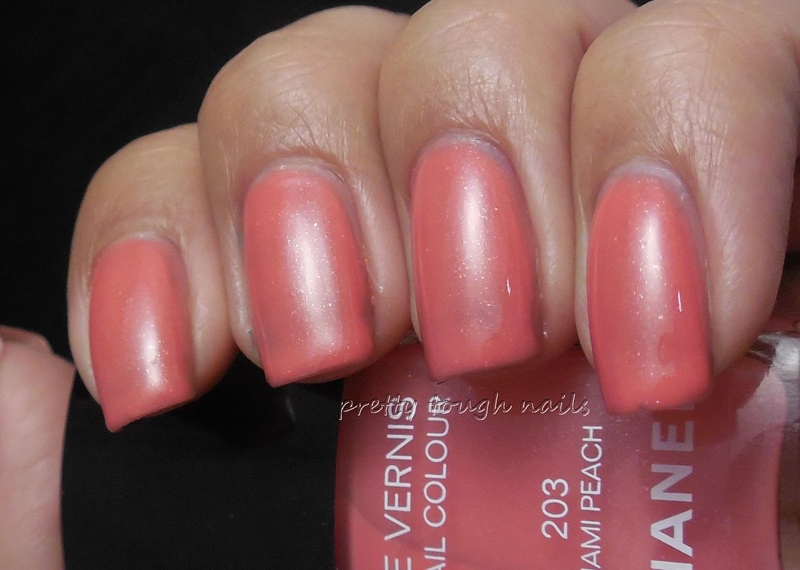 I recently picked up Chanel Miami Peach and I must say, this muted coral crelly with gold flakes is really lovely. The formula was too sheer to be a cream, but not transparent enough to be a true jelly. It was a little difficult to apply because it wanted to pool along the sides, but if you clean the brush off along the top of the bottle, you can apply thin coats more easily. I used three coats in these pictures and finished with a layer of Poshe. I can never resist a polish with gold flakes and despite the not so great formula, I find this color to be really unique and worth keeping - at least until I find a better dupe! It's disappointing to pay a lot for a polish and then not have stellar application, but thankfully I was able to swap for this. Do you know of a good dupe for this color?